This revolutionary, digital, 24 Channel (24 Channels & 8 Remote Commands), 2.4GHz & 900MHz, dual frequency, triple redundant (2x 2.4GHz, 1x 900MHz RF Modules) frequency hopping radio system is fully designed and manufactured by Jeti Model in the Czech republic. This is one of the most advanced radio systems on today's market. With their solid CNC aluminum case with a fully integrated five (5) antennas, a mini USB port, built-in speaker, headset jack. Metal transmitter gimbals with Hall sensors (4096 step resolution) and integrated vibration feedback (Stick Shaker), 9 ball bearings for precision movement, a large 320x240 color, backlight display and many other features the Jeti DC/DS-24s are sure to become the new standard in transmitter performance. One of the attractive features of the Duplex 2.4GHz line of products is it's full integration with all Duplex telemetry sensors. 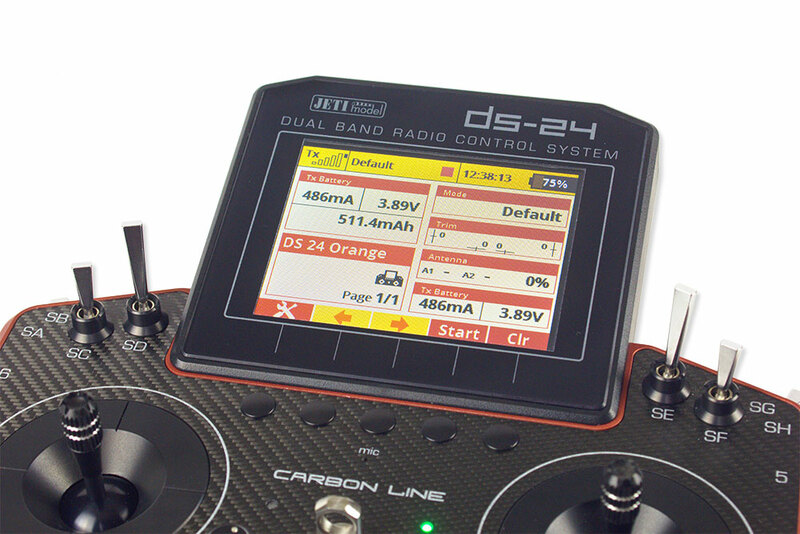 You can easily observe up to 40 different parameters in real-time directly on the transmitter. Or, by using the JetiBox Profi (sold separately) you can see your data in parallel mode giving you and your copilot valuable real-time information (see video). One of the most important features of Jeti's transmitters is the gimbal and switch function assignment flexibility. With the DC/DS-24 you are free to fully customize your radio. You can swap switches or sticks (Mode 1-5) and the on-board computer will recognize your changes and assign functions anywhere you like. Other important functions are programmable Sounds/Alarms and even user-recordable sounds. This audible alarm feature was specifically designed to keep you informed while also keeping distractions to a minimum. We think this is the best way enhance both your enjoyment and your model safety. You can simply set a receiver battery capacity alarm for the desired capacity used and once that number is reached the system acoustically and visually gives you warnings. Dual-Band 2.4GHz & 900MHz, triple redundant with five (5) integrated antennas. Brand new, high contrast, full color 320x240 backlight LCD display.